JULY 12, 2010 — In case you missed it, a new family movie is coming to NBC this Friday (July 16) at 8 pm Eastern (7 pm Central). I couldn’t resist blogging on this since the company promoting the film is none other Motive Entertainment (the company that has promoted family-friendly fare like Polar Express and The Chronicles of Narnia). The company is headed by Paul Lauer. My first job south of the border was working for Paul’s YOU! Magazine (formerly Veritas) in 1996. He hired me as the magazine’s assistant editor and it changed my life. We’ll leave that story for another day. The Jensen Project looks like another winner for NBC (trailer). Motive also promoted the Peacock Network’s last family-friendly movie, Secrets of the Mountain, which debuted on April 16 (USA Network) before airing on NBC last week (July 10). Aside from the obvious need for more family-friendly entertainment, profit was certainly a motivator, too. Secrets of the Mountain, already out on video, was the highest-rated family movie on broadcast TV in the last six months (watched by more than 7.5 million people). 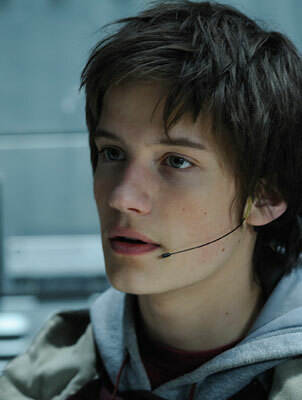 The production values and star power are notched up for The Jensen Project. On the bill are Patricia Richardson (Home Improvement) and LeVar Burton (Roots, Star Trek: The Next Generation). The film also boasts a soundtrack produced by music mogul Randy Jackson (American Idol) that includes songs from Jordin Sparks, Brooke White and Alisan, Ilsey & Jordan. The story line looks intriguing: A secret community of geniuses conducts underground research to help solve some of the world’s most difficult problems. 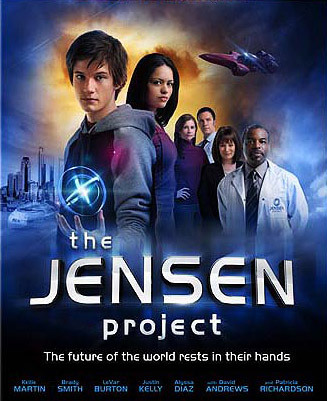 This sci-fi thriller tells the story of Claire (Kellie Martin, Mystery Woman) and Matt Thompson (Brady Smith), two former scientists who return to The Jensen Project after a 16-year absence. Together, with their tech-savvy son Brody (Justin Kelly), the family is thrust into a frantic race to keep a potentially dangerous technology from falling into the wrong hands. As the family scrambles to stop the group’s rogue faction, they rediscover the importance of honesty, courage and being there for one another. Motive also noted that high ratings will illustrate to the entertainment industry that there is a significant audience for family movies and programs. According to Motive’s Vote With Your Remote website, a recent study found that children spend more than 3,000 hours each year consuming entertainment, and a child will see an average of 200,000 violent images on television before age 18. In addition, nearly 80% of parents expressed concern that “profanity, inappropriate sexual content and violence on TV programs has had a negative impact” on their children. Interestingly, The Jensen Project PR calls the movie family-friendly, but the trailer shows some violence, so take note that the movie may be friendly only if your family members are all over the age of 13. Let’s hope viewership is through the roof on this one so Hollywood takes note of a vastly under-served market. Who knows, they may even start delving into an even more under-served market — Christian family films. I wonder if it will be available through the web or DVD for those few weirdos with no television antenna or cable? TV movies tend to come out on DVD almost immediately. This one is available at Amazon and Wal-Mart online.